Matthew Fitzpatrick during the final round of The Open at Muirfield. Picture Eoin Clarke www.golffile.ieMatthew Fitzpatrick, 18, of England, curled in a par putt on the 33rd hole to clinch a 4-and-3 decision over Oliver Goss, 19, of Australia, on Sunday and win the 2013 U.S. Amateur Championship at 7,310-yard, par-70 The Country Club, writes the USGA. Fitzpatrick became the first Englishman since 1911 to hoist the Havemeyer Trophy as U.S. Amateur champion. Harold Hilton won the championship 102 years ago at The Apawamis Club in Rye, N.Y. Fitzpatrick also joins a group of English players who have won recent USGA championships, including current U.S. Open champion Justin Rose. Goss, who was bidding to join Nick Flanagan and three-time champion Walter J. Travis as the third Australian to capture the U.S. Amateur, trailed by one hole after the morning round. But he squared the match on the first hole of afternoon play when Fitzpatrick was unable to convert a 7-foot par putt. Fitzpatrick, who is No. 2 in the World Amateur Golf Ranking, won the next two holes to go ahead for good. He was conceded a 3-foot par putt on the 20th hole when his opponent missed the green to the left and ended up in thick rough. Another two-putt par on the next hole gave him a 2-up margin when Goss missed another green, leading to a bogey. Goss, who reached the U.S. Amateur quarterfinals last year at Cherry Hills Country Club, near Denver, trimmed the deficit on the 27th hole. He made a 3½-foot par putt on the par-4 ninth, while Fitzpatrick was short of the green with his approach shot and made bogey. 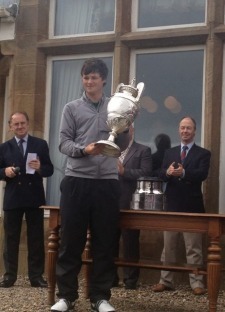 Fitzpatrick, the low amateur at last month’s British Open Championship, regained his two-hole advantage on No. 10, the 28th hole of the match, when he rattled in a 10-foot par putt from left of the hole. Meanwhile, Goss had to hit his third shot from heavy rough near the green and his 12-foot par putt broke over the edge of the hole. After halving the subsequent three holes, Fitzpatrick won hole Nos. 32 and 33, a pair of par 4s, to wrap up the championship. He missed the 505-yard 14th to the left of the green, but got up and down with a nifty pitch and a 4½-foot putt. The Northwestern University-bound Fitzpatrick made a 5½-foot putt for par on the 15th, while Goss was not able to hole his short par putt. In the morning, Goss won the fifth and sixth holes with birdies to take a 1-up lead. He hit his approach shot to within 2 feet at No. 5 and sank a 7-foot birdie putt from left of the hole on No. 6. Fitzpatrick, the 2012 British Boys’ champion, squared the match on the following hole with a 35-foot uphill birdie putt, before losing No. 8 when he found the right rough off the tee on the 368-yard, par-4 hole, leading to a double bogey. Fitzpatrick, who defeated Corey Conners, of Canada, 2 and 1, in Saturday’s semifinal round, won consecutive holes on Nos. 12 and 13 to go front. Goss three-putted for bogey on the par-4 11th, and Fitzpatrick sank a 22-foot birdie putt on the par-5 12th that crossed a ridge in the middle of the green. Goss, whose semifinal opponent Watt served as his caddie for the final, squared the match on No. 14 when Fitzpatrick missed the green to the right with his approach shot and was unable to convert a 6-foot par putt. Fitzpatrick regained his 1-up advantage on the next hole. He was conceded a 4-foot birdie putt when Goss’ chip from behind the green rolled past the hole and off the front of the putting surface, leading to a bogey. The players halved the final three holes of the morning, including a pair of dramatic pars on No. 18. Fitzpatrick hit a 58-degree wedge from a hanging lie in front of the right greenside bunker and made a 24-foot putt to get up and down. Goss barely made the green’s first cut of fringe with his third shot before sinking a 16-foot chip with a 60-degree wedge. By reaching the U.S. Amateur Championship final, Fitzpatrick and Goss have each earned an exemption into the 2014 U.S. Open at Pinehurst Resort & Country Club in the Village of Pinehurst, N.C. – provided they remain amateurs – and a likely invitation to next year’s Masters Tournament. Fitzpatrick is also exempt from qualifying for the 2014 British Open. BROOKLINE, Mass. – Result from Sunday’s championship match at the 2013 U.S. Amateur Championship, played at 7,310-yard, par-70 The Country Club. Scotland's Jamie Savage hit a sensational 203-yard rescue to 10 feet at the 18th to set up what proved to be a winning par in the Irish Amateur Open Championship at a wet and windy Royal Dublin.